Have you worn puffy twists? Would you do it again? This article was originally published on January 2012 and has been updated for grammar and clarity. I'm absolutely in love with the Havana twists you linked on your site. I've always avoided braids because of the tension on my ends but those are so big and natural looking! Those Havanas are goreous!!! I made the mistake of not blowing out my hair for my last trip to the braid shop and my braider nearly burned my scalp with that hair drier, and the comb she used was way to small for my thick hair. She did a good over all job, and I have had them in for about 6 weeks, but I am so ready to take them out. Beautiful style, but I couldn't deal with the three day takedown time. Torture! As always your pics are absolutely gorgeous. The extensions look beautiful on you. That said, extensions are not for me. I'm almost 2 years natural. I started with a texturized TWA so I never BC'd. After periodic trimming, my hair is currently CBL (stretched). I have 3c/4a strands that are very dense. Thankfully, I don't need any help with thickness. Also the time, expense, and risk are not worth it for me. LOVE LOVE LOVE This hairstyle. I usually use to get braid extensions but after going natural I realized that they put a lot of pressure of my nape and always got clumped up during removal. So I gave up on them :/ But I might try senegales twists they look really cute. Twists are easy to install and take down. I'm a little surprised though that yours took 7.5 hours to put in, that's a really long time! I had twist extensions when I was transitioning. 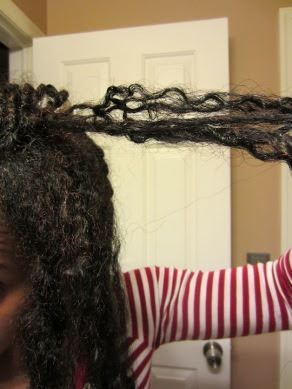 I knew nothing about length retention at that time, and I had little patience for detangling, so what I am about to say should be taken with a grain of salt. When my twists were twisted from the root, my roots matted. When they were braided at the root, take down was much easier. I've never had extensions (of any type) and would never get them. I've seen too many people suffer from irreversible scalp and hair damage as a result, so I guess I'm too concerned with that possiblity. I've been natural for 12 yrs. and would have possibly used extensions for very short periods of time when I was transitioning (before seeing what I have seen over the years). Your hair looks lovely in the pic with the flower! how much growth did you see? Looking good Shelli but extensions not for me--don't have the time or patience and the take down scares me! I have a couple of questions: I wanted to know how many packs of the hair did it take to complete your style? Also, did you have to purchase the hair online or was it available in local hair stores? So did your hair grow a lot? So anyway just gomna take down sections do its not overwhelming. I've refreshed just the front and back and it looks brand new! My goal is to hit the 3 month mark. I'll be putting them back in immediately even though it took me 15 hrs to install! I'm sure I'll be much faster and shave a lot of hours off now that I have a better idea of what I'm doing. I length of my "dreads" is almost to the waist so that takes a lot of time but it has been worth every second. The growth is just mind baffling and I can wash any time just get up and go in the mornings. I believe that some of the matting could have been reduced by not using oil on the scalp, but instead a braid spray. I get afro twists extensions about once a year and supposedly they are to last 3 months, but I've noticed that my hair tends to grow so much while wearing them AND because it is so close to my hair texture, I usually cannot go that long. Doing so would surely mean having locs against my will. For me, they are so easy to maintain and besides wash days, I usually just spray my hair with a liquid moisturizer each day and then go. I always go to the same African braid shop and the owner/stylist there is always good to my hair. The twists are never too tight and she works fast. She knows what she's doing and she monitors my hair progress each time I go to her. When I take them down, because my hair texture is so similar, I have to really moisturize my twists which makes them easier and tangle less. * BTW, my profile pic is me with the extension twists. Anon @ 12:11 ... Hahahaha ... I'm laughing because I said to the lady when I walked in, "How long do you think it will take, 8 hours?" She was like, "Nooooo, 5." I laughed in my head because other than the time I had bob length thick box braids, it took at least 8 hours (if not more) to braid my hair ... even with two people sometimes. My hair isn't thick, but it's dense, I guess. It just ALWAYS takes close to 8 hours. When she finished, I looked at the time and was like ... "Almost 8 hours." *lol* And, she didn't take even one break! I've been to places where they break for lunch or a snack. Nope, she was at my head the ENTIRE time. Anon @ 1:25, I think I saw my normal amount of growth, maybe slightly more ... I think I got about an inch in 6 weeks. However, it's hard to tell because that first week when they loosen, there is slippage. I think I took a photo of the growth at some point, but I'll have to look for it. LJAuNaturale, I used 2 entire bags of hair. It got close at the end there, because the twisting hair wasn't quite long enough to cover the length of my hair. So, the braider had to add pieces to the ends. She had kind of run out of hair towards the very end, but she was able to salvage pieces that would have otherwise been swept away and thrown in the trash to finish the style. As to purchasing the hair, I did have to buy it online. I couldn't find it at any relatively local BSSs. However, when I got to the braiding salon, I learned that they'll order it and they get a lower wholesale price. So, if you know where you want to go to get it done, you can check to see if they have it or will order it. 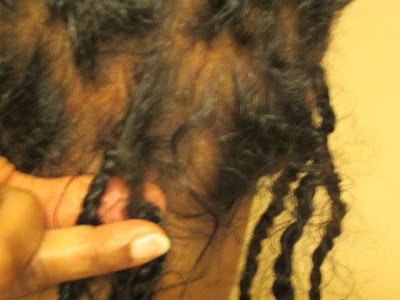 I found out about the hair from another blogger who went to a braiding salon that supplied it. Also, someone commented somewhere on my blog that their local BSS sells it. So, you'll probably have to check around to see if you can get it on the ground. If not, then you have the option of ordering online. The hair is $9.99 a bag online and if you e-mail the guy from eCrater, he will do a flat shipping fee of $6, no matter how many bags you order. At least, that's what he told me when I ordered. Anon @5:06, I LOVE yarn/genie braids! I just posted on my blog that I was considering them. But, I'm scared that the take down will be even worse than this one was. So, I think I'll be passing on those! As to how I took them down, I did the same thing and had a similar plan. I expected to break it down over two days. I planned to do the back one day, cover the loose hair with the front twists the second day for work and finish the job in the evening. However, it took WAYYYYYYY longer than I expected. The twists were so thick, I had no problem concealing my released hair. But, it was still overwhelming and frustrating spending 11 hours over 2 days taking out twists and knowing that I had at least another 7 hours in front of me given how many sections remained and knowing how long the prior sections took to release. I'm having a flashback now ... *sigh*. Anon @ 5:25, really? Hmmm, I can see that. I wanted to use my EO mix as that's what I always use on my scalp. But, I can see what you mean. I'll have to remember that. Libby, CUTE!! I wish I could have a shape more like that. I contemplated asking for the "layers," but that would have meant adding even more hair to the ends. Also, didn't really think about it until I saw the finished look. Anyway, I agree that it's so lovely to have easy hair!! LOVED it! For me, the money isn't the drawback so much as the full day to get it done! However, I've always been able to write that off as worth the sacrifice because of the time saved in daily/weekly maintenance. Well, the take down time negated all of that! But, if I can decrease that time by having them installed differently, it'll be worth it. I might try one more time (not any time too soon though). If I have another nightmarish take down, that'll be it for me though. The braids looked gorgeous and versatile but 60+ hour takedown would be it for me. I wouldn't even need to create a pro/con list LOL! You have a lot hair so I guess it's not too surprising. 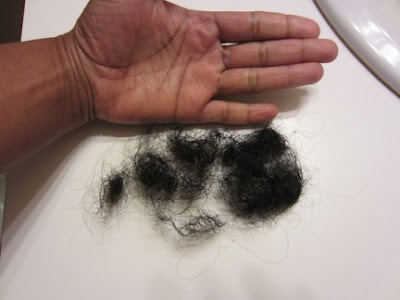 I stopped getting braids after my relaxed hair got to a certain length, it was just too much work. This post made me feel like I'm taking a step in the right direction for my hair. I'm finally jumping on the protective styling bandwagon...2 weeks ago i decided the best way for me to stay out of my hair was to make my return to box braids (Solange's box braids last year, got me inspired). I wore small ones last summer, and my hair was so happy to have had a break. This time i made them bigger and i love them! Daily i spray infusium 23 and water on the length of my hair, i oil my scalp every other day and i spray shea moisture's moisture mist on my braids every few days. i wash my scalp once a week with watered down shampoo, and deep condition afterward. The last time i did this my hair was super soft when i took down my braids. I plan to keep this set up for 2 months. From now on I hope to start doing twists or bigger braid extensions for a couple weeks at a time for protective styling. What does cornrow at hairline mean?? Do they cornrow going back??? This was such a great post! Very informative. I've been wanting to get twists for a while as a good protective style to keep in for a couple weeks but I want my own hair to be twisted. No extensions. I just need more info on how to keep them moisturized, and clean. Also some cute styles too. I'll probably keep them in a mid-high bun most of the time, just to keep my ends tucked away. I also don't really know the procedures for taking them out too. So this post definitely helped. Anon @ 2:26, yes. You can see the cornrows in a couple of the pictures. Erica and Erocka, thank you! Glad that you enjoyed the post!! 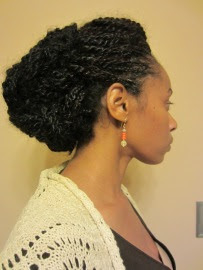 I'm curious about this hair... Can you use it for box braids? Hahaha ... Susie Carmichael!! Like, the Rugrat:)? Too funny! And no problem:). Unknown, I don't see why not! Though, I'll admit, I've never seen anyone use it for that. I've used Marley hair for braids on my niece before though and it worked fine. So, I would think that this would work similarly. I am currently wearing Spring Twist, (Using E-On Hair) and I love them. I installed them about 4 weeks ago and I have no complaints. I too have fly aways, but my hair frizzes up easliy so that isn't a problem. Besides, I think that makes it more natural. I contimeplated using gel on the length of my hair, but I decided against it. I have re-done my edges and the take down wasn't bad. They unravelled rather eailiy. Great thing about this hair is, I took the twist out and re-used the same hair. I will probably do an overnight prepoo with extra virgin coconut oil & a ton of V05 conditioner prior to taking them down. My hair is also past shoulder length so I am unable to cut any of the twist. Will I do them again? Absolutely! I have never worn twist before (other than my own hair) so I was pleasantly surprised at how natural they look. My husband laughs at me because I can't go anywhere without at least 1 person commenting on my hair.